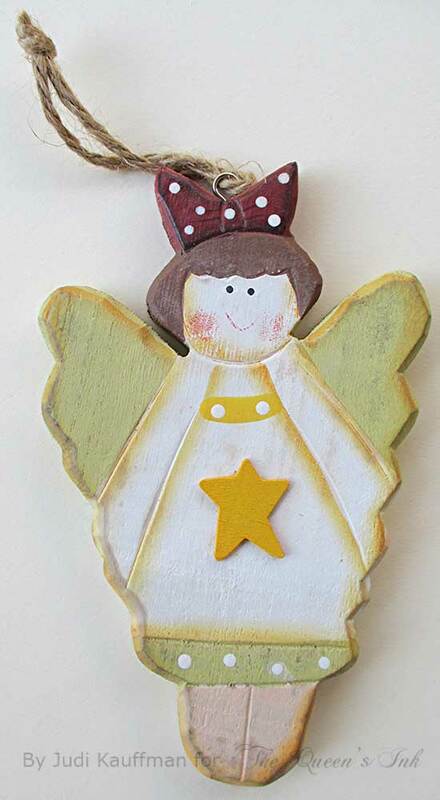 A friend gave me six cute 7” tall wooden angel ornaments that she no longer wanted. I politely thanked her, tucked them away for a few years, and forgot about them till a recent clean-up. 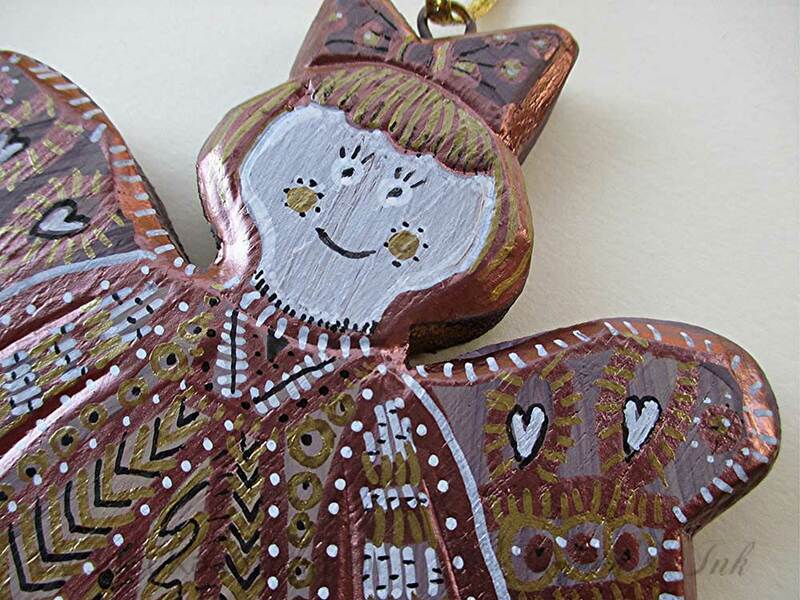 Because ‘cute’ isn’t my style, I thought it would be fun to alter the angels with paint and pens, giving them a very different look! What do you have that could benefit from a total re-do? If the answer is ‘not a thing’ then head to a yard sale, thrift shop, or ask a crafty friend to share some of her unused stuff. Can you flip the item around and turn it into something new? Think outside of the box! 1. Paint the surface of whatever you’re altering. A base coat of gesso and a coat or two of acrylic paint should do the trick. 2. Trace around the shape and sketch some ideas on paper before you commit. 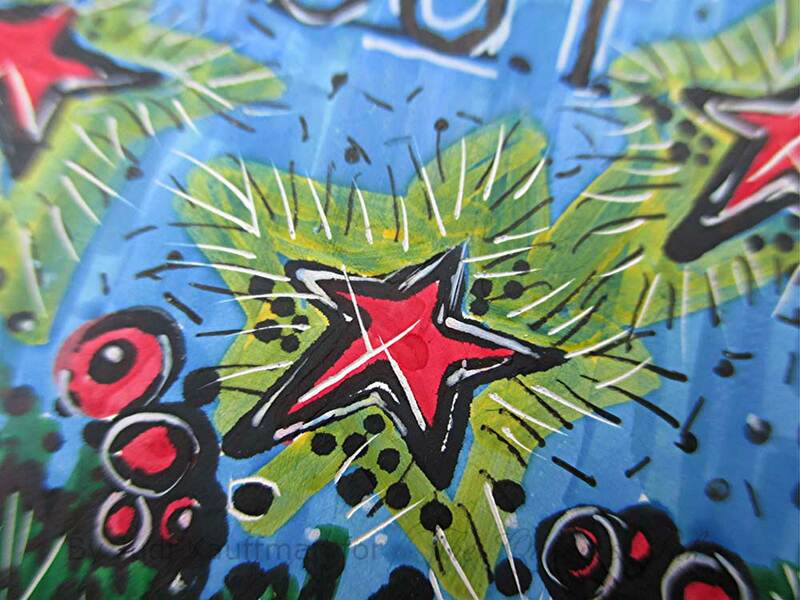 Or if you’re feeling fearless and confident draw straight onto the painted surface without any pre-planning. 3. Use paint pens or paint and fine brushes. Doodle and alter your ________ (angel, star, circle, mask, whatever….). Stop at intervals, get away from the project so you can come back with fresh eyes and see if you need to keep going or if it’s DONE. 4. Keep going until you are content with the project. 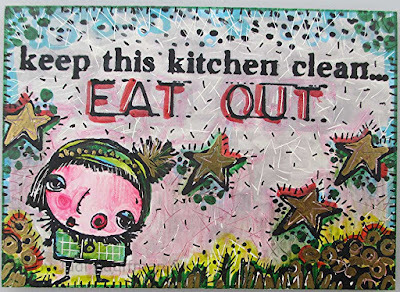 If you add too much and aren’t happy, paint over whatever you’ve done, sand the surface a bit and start again! Need some last-minute gifts? No problem! Here are two you can whip up in no time, and if you’re already done with presents for this year, bookmark the idea for other occasions and for next year’s holiday season! Great as stocking stuffers, place cards for a festive table! Paint a jumbo clothespin or leave it as natural wood. Add embossed Shimmer Sheetz to the front, or both front and back. Lightly sand the Shimmer Sheetz to tone down the sparkle and reveal the core color (Gemstone has a silver core, Iridescent is white), and/or alter the SS with alcohol inks if you want! 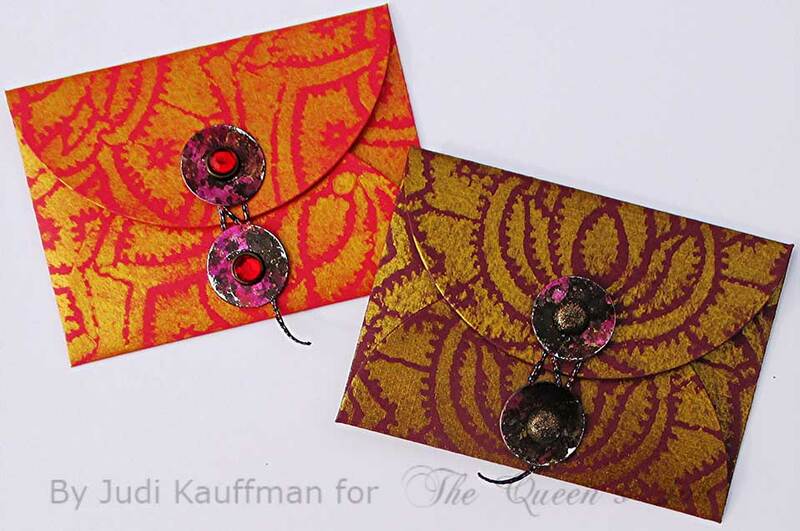 Embellish with fibers, sequins, gems or in whatever way you choose. 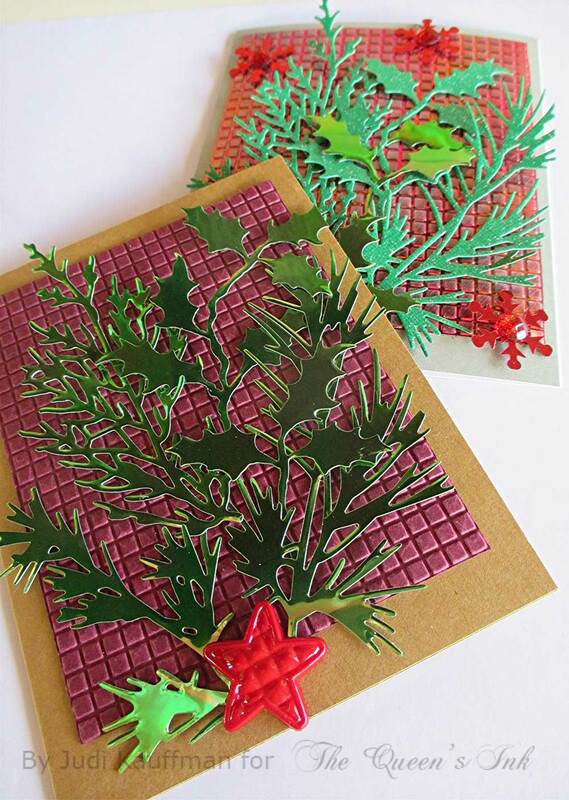 Terrific party favors, stocking stuffers, teacher gifts; make one for yourself! 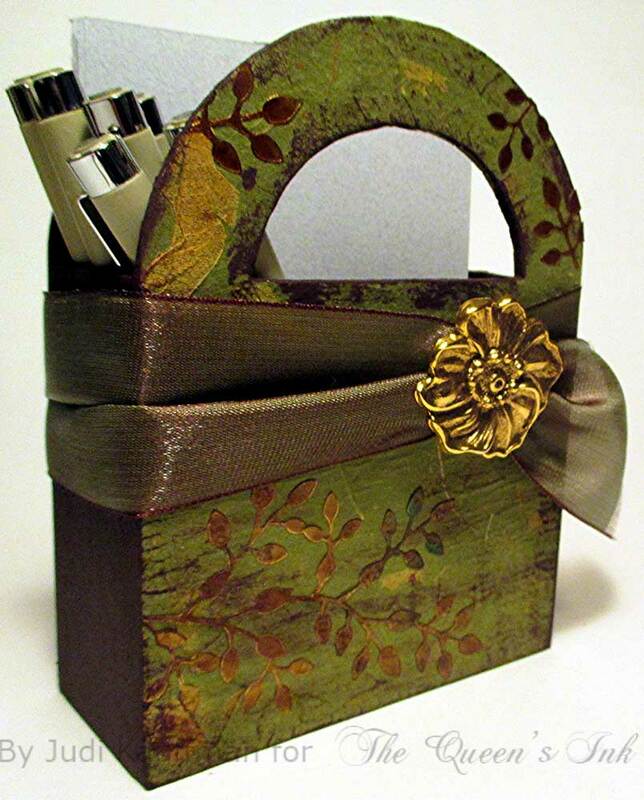 Paint a wooden favor bag or any similar small container with straight sides. Add embossed Shimmer Sheetz or handmade paper to the front, or both front and back. 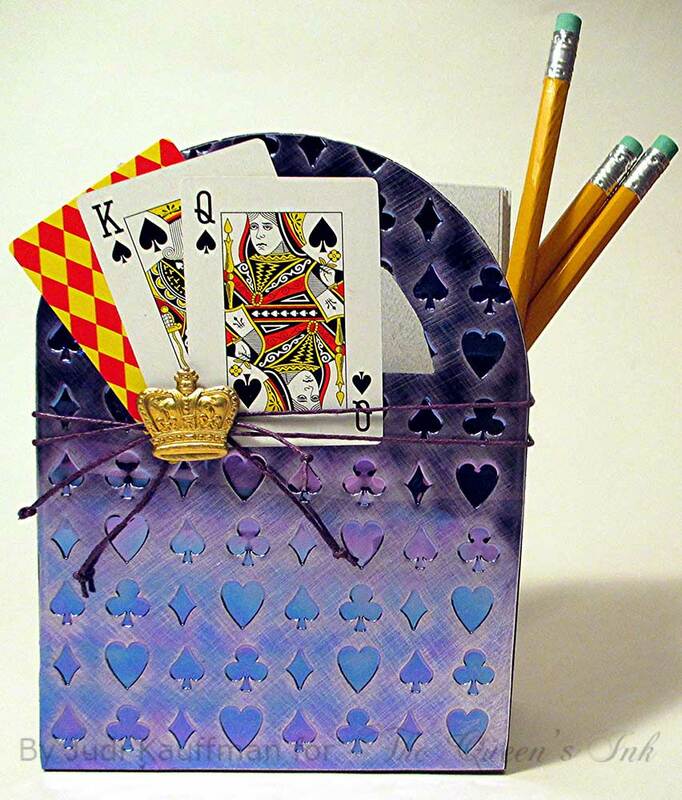 Embellish with miniature playing cards, leather or paper cord, ribbon, charms or other dimensional elements. 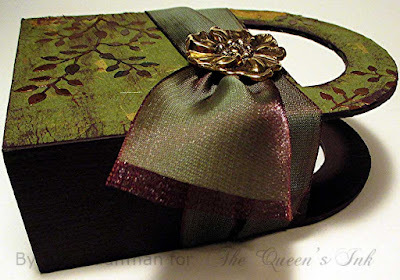 Tip: Fray the end of the ribbon to add a special touch. 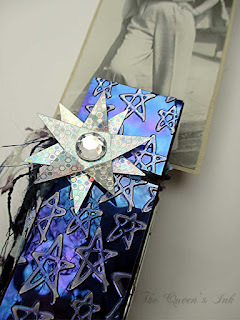 Use slivers of strong hold Tombow Power Adhesive Tabs to secure the sequins and metal charms. (Cut the Power Tabs with non-stick scissors.) 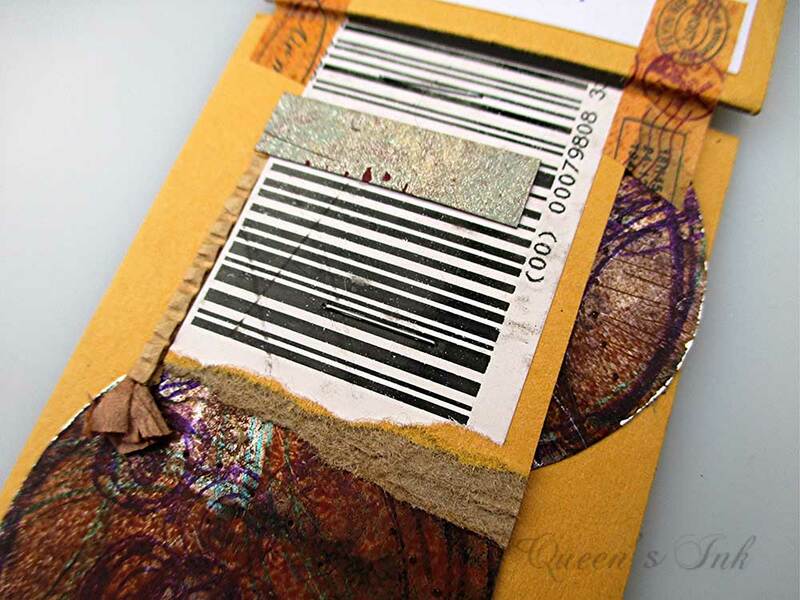 Use double-sided adhesive tape to adhere the Shimmer Sheetz and handmade paper. 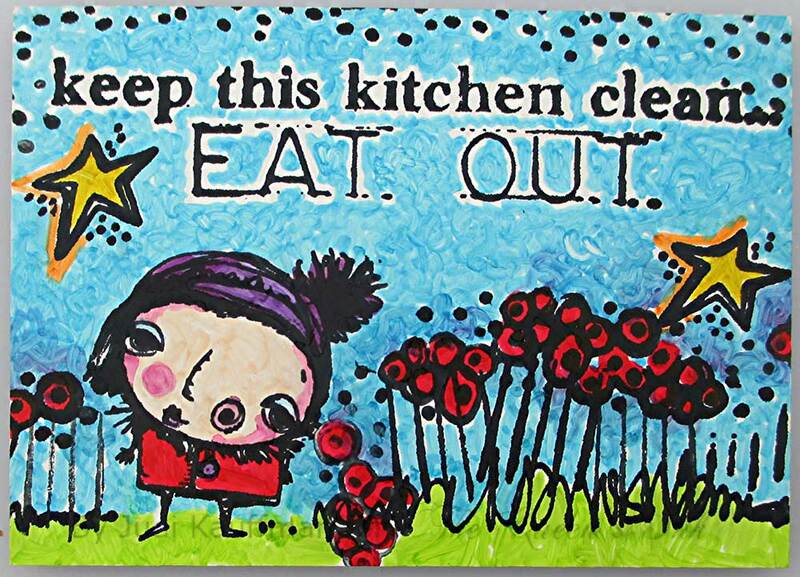 You’re welcome to share my mantra: Easy Isn’t Cheating! Gift cards are such a popular way to celebrate holidays, birthdays, and other occasions. 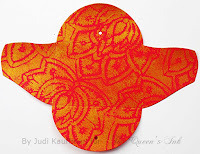 One of my favorite ways to present them is in a hand-stenciled envelope. For me, taking that extra step, creating a custom envelope, is well worth a few minutes; they’re easy and fast, and a lot of fun to make! I always make a big batch so I have plenty on hand. 2. Stencil the envelopes with gold acrylic paint or whatever color(s) you prefer. 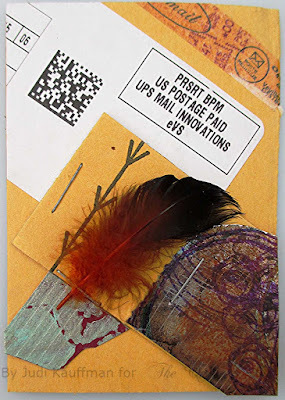 Tip: Make sure your stencil is large enough to cover the entire envelope when it is open and flat with all flaps extended as shown in the photos above. I chose 9 x 12 stencils to ensure that I wouldn’t have to move the stencil once I had positioned it. 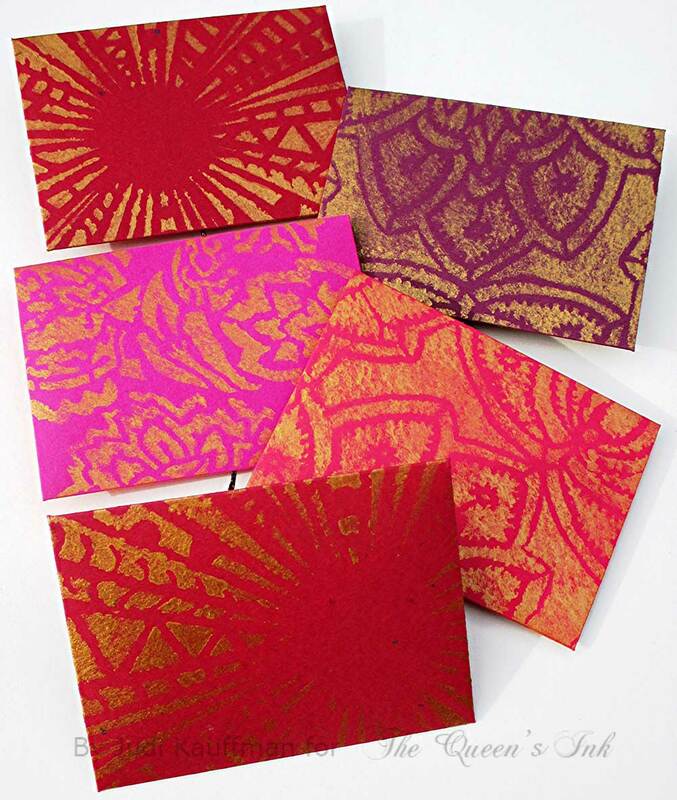 Large stencils with all-over or radiating patterns give lots of options for taking advantage of various elements within the designs. *Instead of a gift card, tuck in folded cash or golden dollar coins, movie tickets, or a personalized coupon good for homemade brownies or a pie! *For envelopes that can be tied onto bottles or used as napkin rings, punch a hole in one corner and add a piece of ribbon BEFORE tucking something inside. *Use stenciled envelopes to hold Artist Trading Cards. 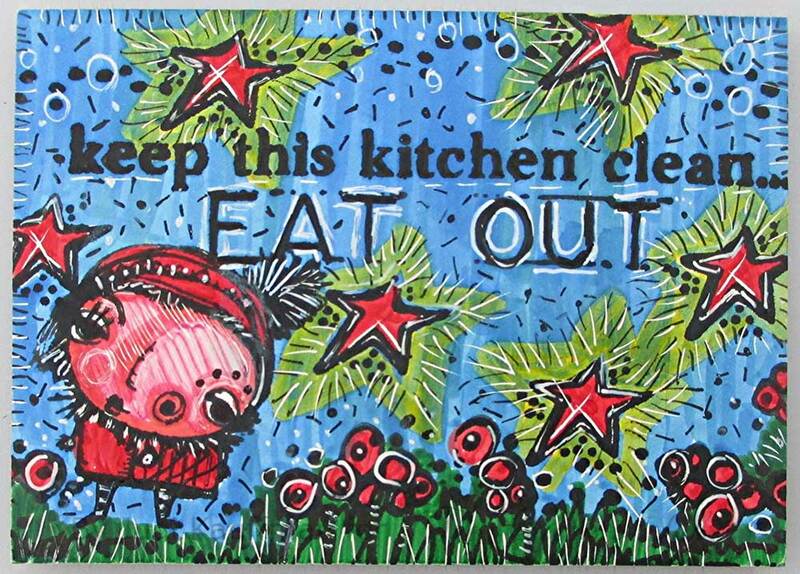 I loved Tim Holtz’s Holiday Greens Sizzlets dies right from the get-go! There are four in the set – realistic, bold and graphic, just right for so many projects. And the Kaisercraft Grid embossing folder was right up my alley, too. Together: Cards that are easy as pie. Actually, even easier than pie! 1. 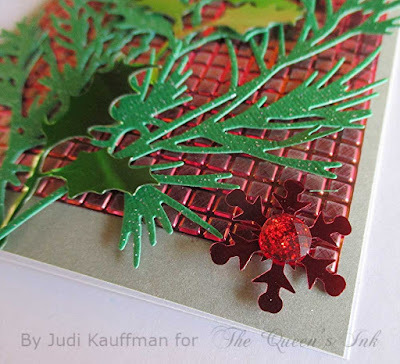 Die cut the greens from green glittered cardstock, Emerald Gemstone Shimmer Sheetz, or a mix of the two. 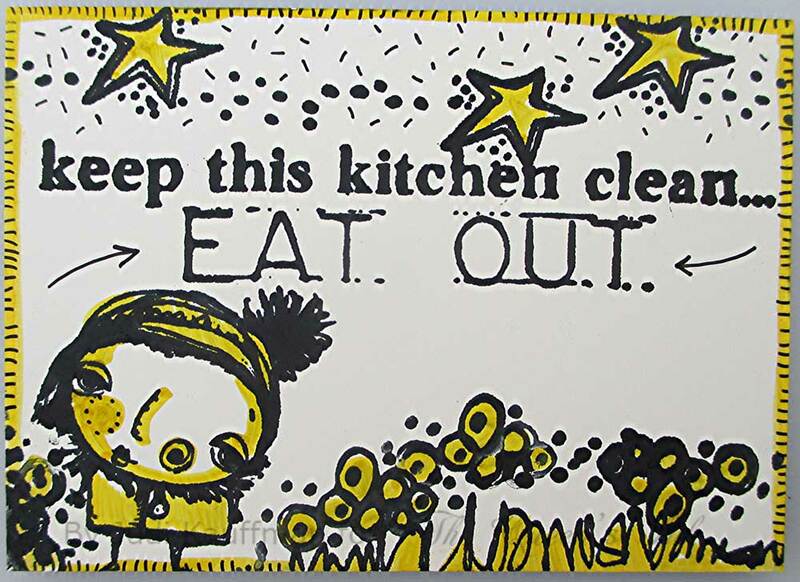 (See REMINDER following Step 5 of the recipe.) Tip: When removing these intricate die cut shapes from the die, always begin at the stem end and work slowly and carefully so the delicate stems don’t tear. 2. 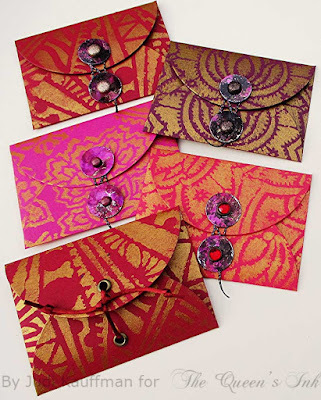 Emboss wine red cardstock or Ruby Gemstone Shimmer Sheetz with the grid embossing folder. Option: Tone down the Shimmer Sheetz by lightly sanding the surface. 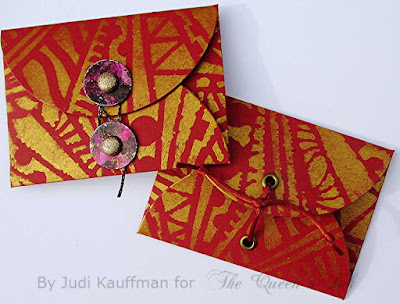 Adhere the embossed rectangle to a side-fold A2-size card base using double-sided adhesive tape. 3. Arrange and adhere the greens as shown or as you prefer. Use tiny slivers of Tombow Power Adhesive Tabs to hold the die cut greens in several places, allowing most of the leaves and needles free from the surface for lots of dimension. 4. Embellish with a red star-shaped button (shank removed) or a trio of red gem-topped snowflakes (die cuts or sequins). 5. Trim any greens that extend past the edges of the card front. You MUST use a Metal Adaptor Plate or the Sizzix Big Shot with Precision Base Plate when die cutting Shimmer Sheetz. Review Els van de Burgt’s YouTube tutorial if you are new to this technique. *Switch to a brighter color palette or go for a monochromatic scheme like ivory, white, and silver. *Instead of an embossed grid background, use textured handmade paper or cardstock with a small all-over dot pattern. 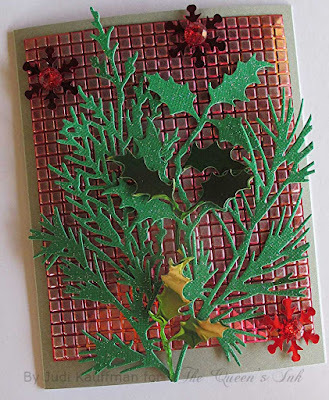 *Position grid and greens on a larger size card base (5 x 7 works well), leaving an inch or more at the bottom; add a bow (ribbon or twine) where the stems touch at the bottom of the cluster of greens so they look like they’re tied together. 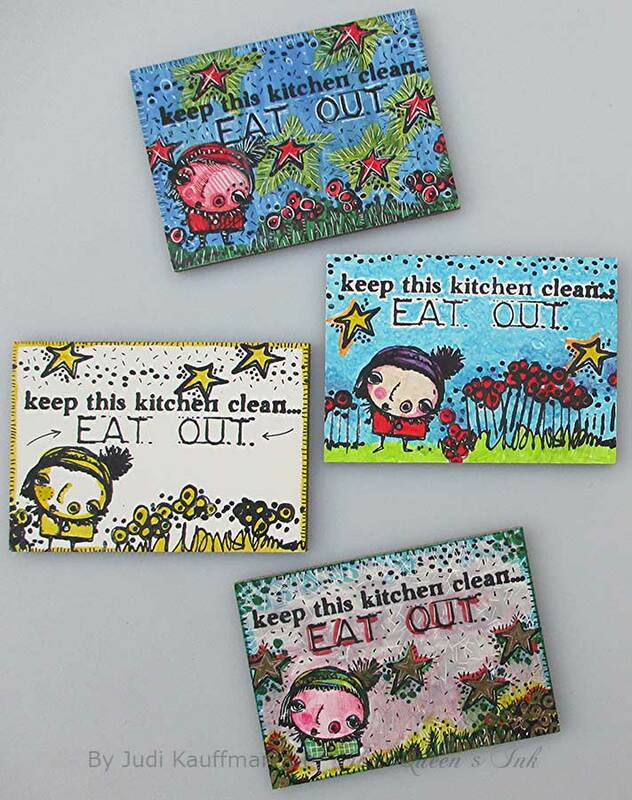 Nathalie Kalbach’s new foam stamps from ArtFoamies (available at The Queen’s Ink, of course!) are such a treat. If I had to pick a favorite, it would probably be ‘Santiago’ – the one I chose for this project. 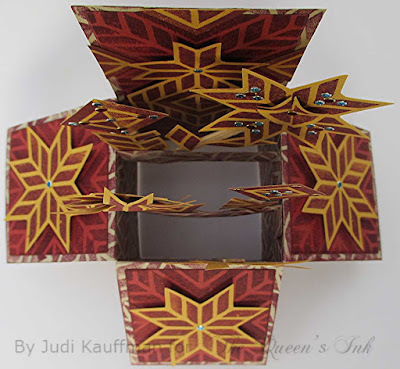 It is a square pattern that works beautifully as an individual unit and can be repeatedly stamped to create a variety of allover designs as well. If you asked me to pick a favorite tomorrow instead of today, I might choose a different stamp (the ‘Batik’ series caught my eye…), so thank goodness I was able to add several to my collection. And there will be more in the future, I’m sure. The idea for using the Santiago stamp to create gardens happened by accident. 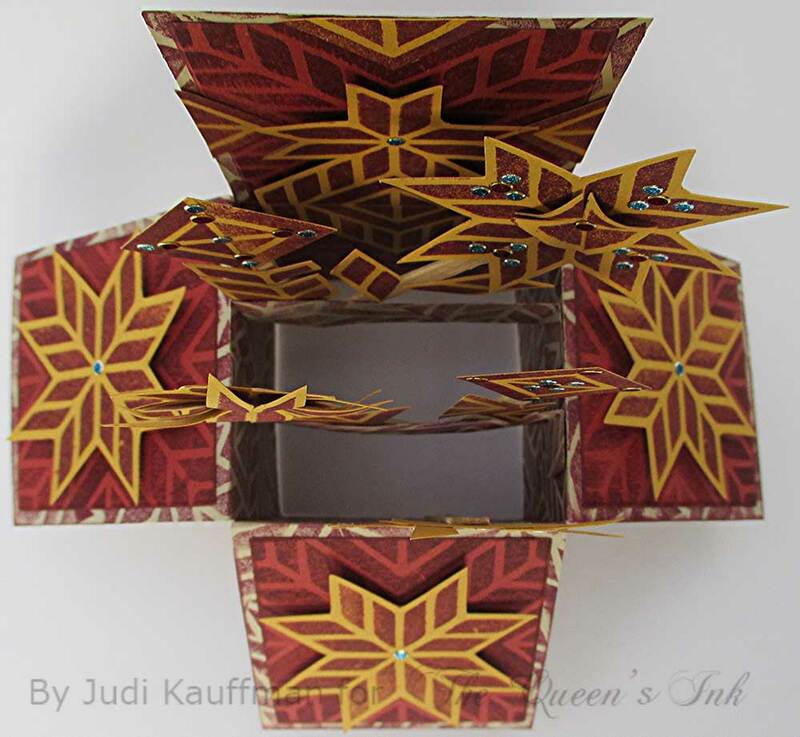 I constructed a Card-in-a-Box without planning what to add to the interior (the pop-ups). After cutting individual motifs for the fold-out sides and the tall backing section I was left with a bunch of scrap pieces. AHA! Flowers! 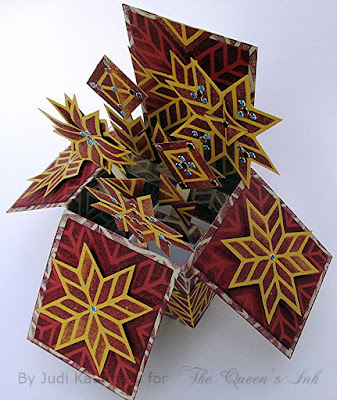 The exciting thing about Card-in-a-Box projects is that they fold flat for mailing, though this one is a bit lumpy because of the wooden stir sticks I used as stems for the flowers and will require additional postage. 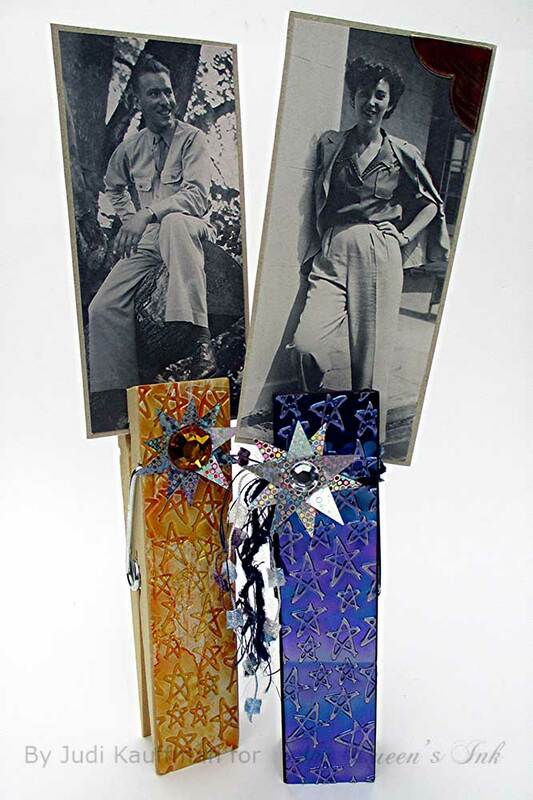 After finishing the flowers for the Card-in-a-Box I ended up with a long scrap that looked like it would work well for a bookmark. This time I used the Santiago leftovers for the ground, not the flowers. 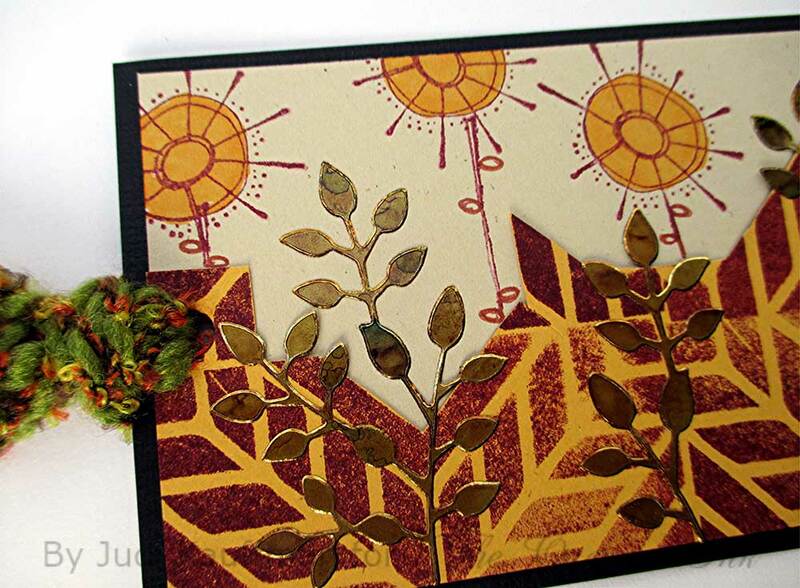 I added alcohol ink-altered peel-offs for the ‘greenery’ and used RubberMoon stamps for the round flowers and straight stems. I drew the little leaves. 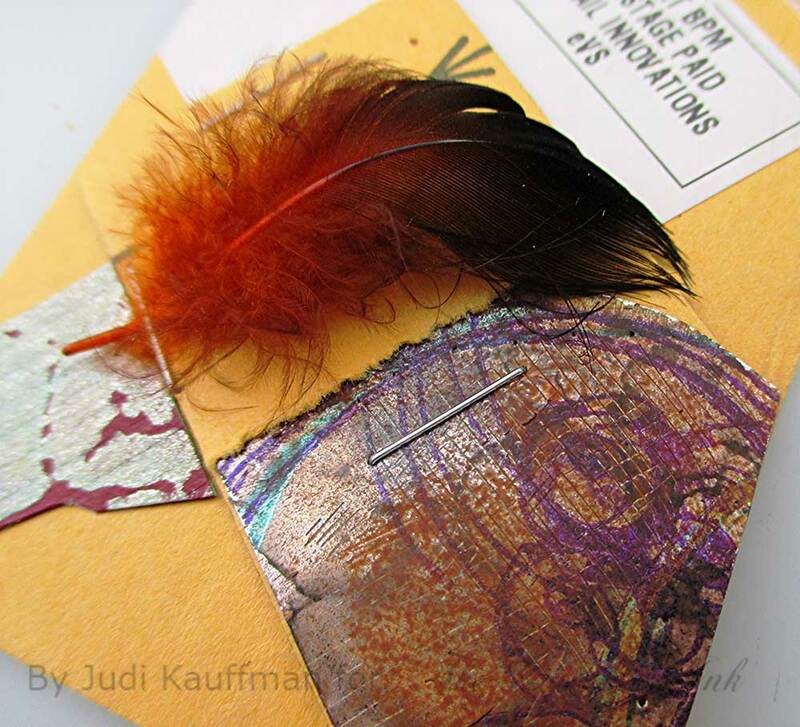 You may recognize the Stampstracts stamp I chose for the bookmark flowers – it was used for the EYES on owls in a blog post a few weeks ago. 1. Choose three pieces of heavyweight cardstock (100lb) in coordinating colors. 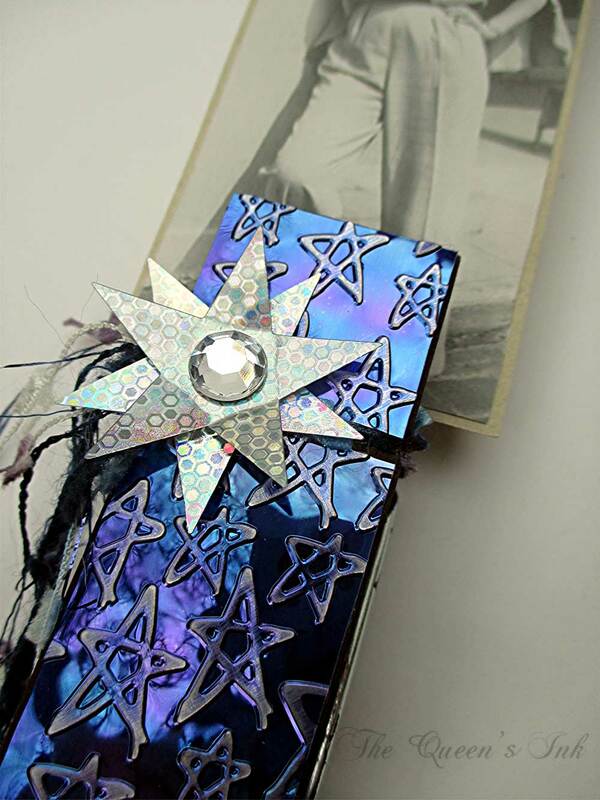 (If making a bookmark, add black or another color as the fourth.) Keep the same color palette or change to whatever combination you prefer. 2. Hand- or die-cut the pieces for your Card-in-a-Box. Use the first color for the main piece. 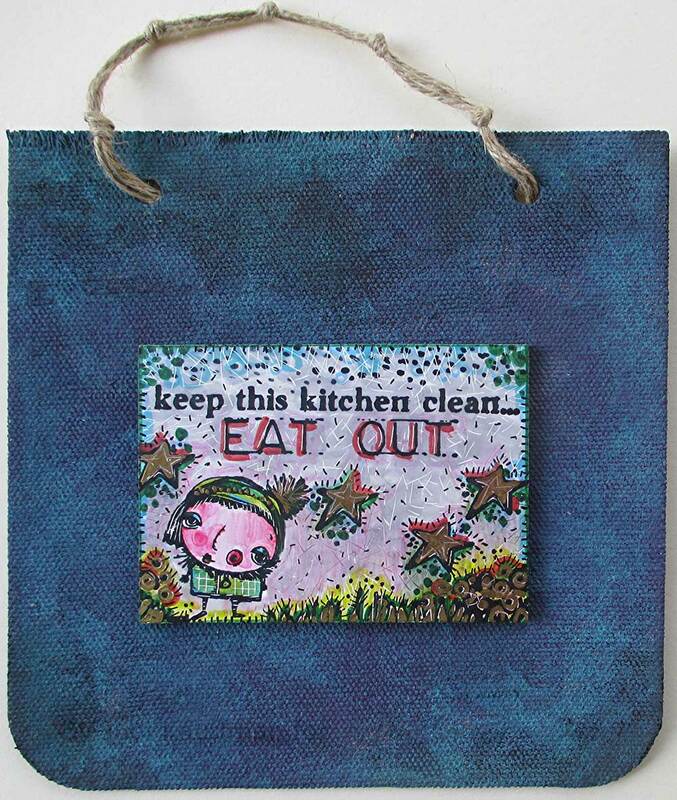 Use the second color for the decorative rectangle (backing) and 3 side pieces. 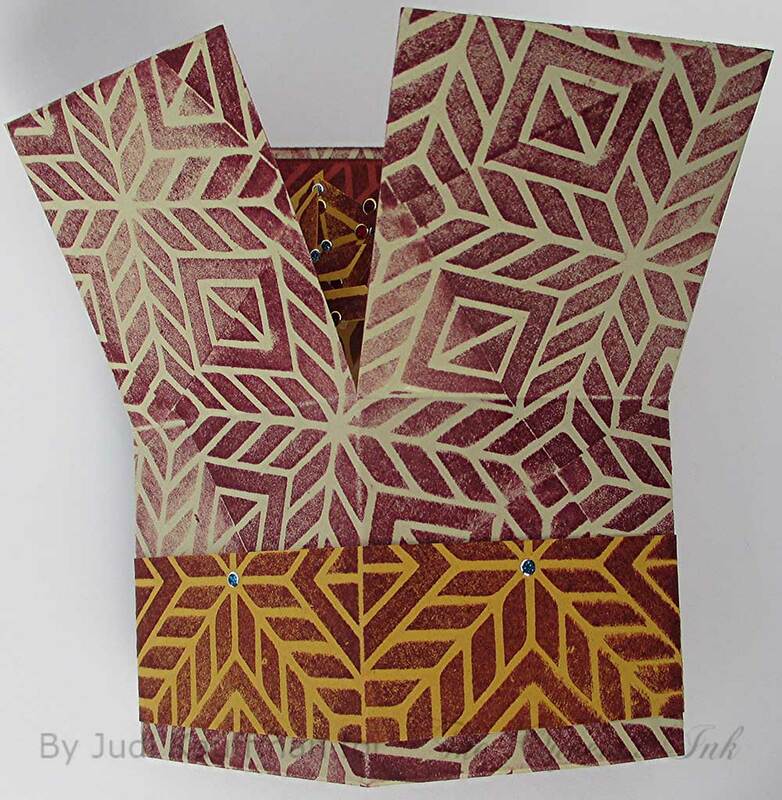 A quick Internet search will provide patterns and tutorials. I used an AccuCut die; the finished card measures 5.5” wide and 6” high when closed. The side pieces are 2.5” x 2.75”, an almost-perfect fit for the Santiago stamp. The stamp is 2.75” x 2.75”. 3. Stamp Santiago square repeatedly at an angle all over the inside and outside of the main piece. Stamp the long backing rectangle and three side pieces with the full Santiago square (not at an angle). 4. Stamp Santiago repeatedly to fill the third piece of cardstock. I stamped a 12” x 12” sheet. Cut out the decorative pieces for the sides and backing. Adhere with foam squares to add dimension. 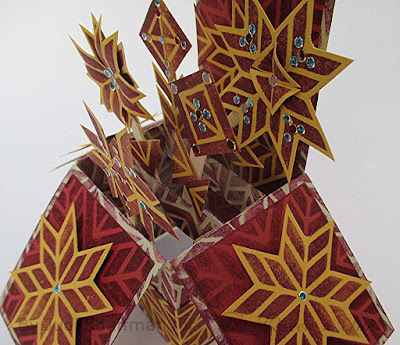 Accent the center of each dimensional element with a Glitter Dot. 5. 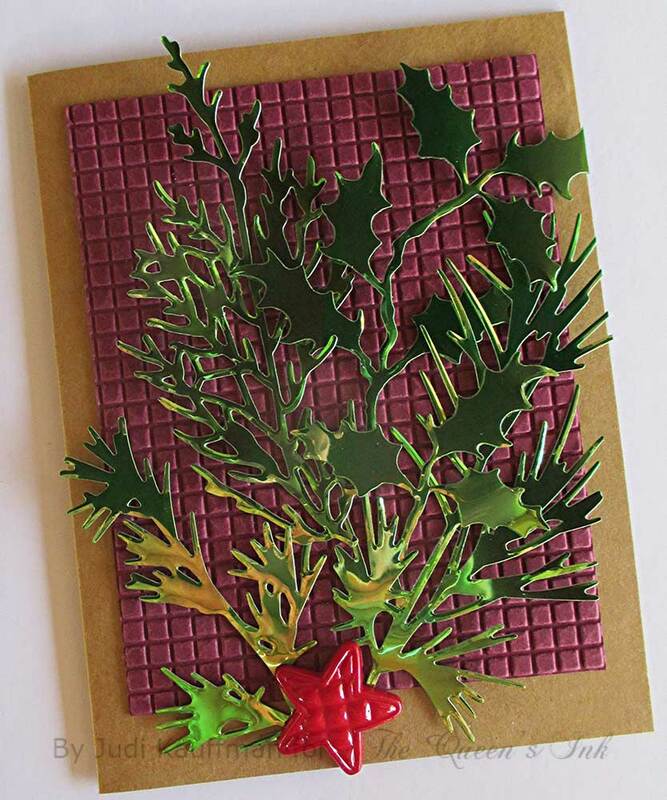 Next, cut assorted pieces for the flowers. Shape and layer them. 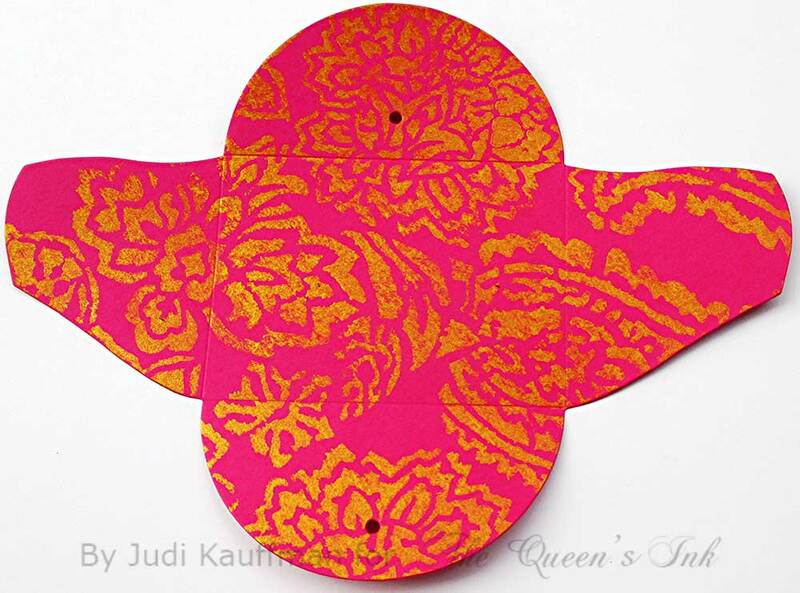 Embellish with Glitter Dots in two or more colors. Adhere flowers to stir sticks; glue the flower sticks to the inside of the card as shown. 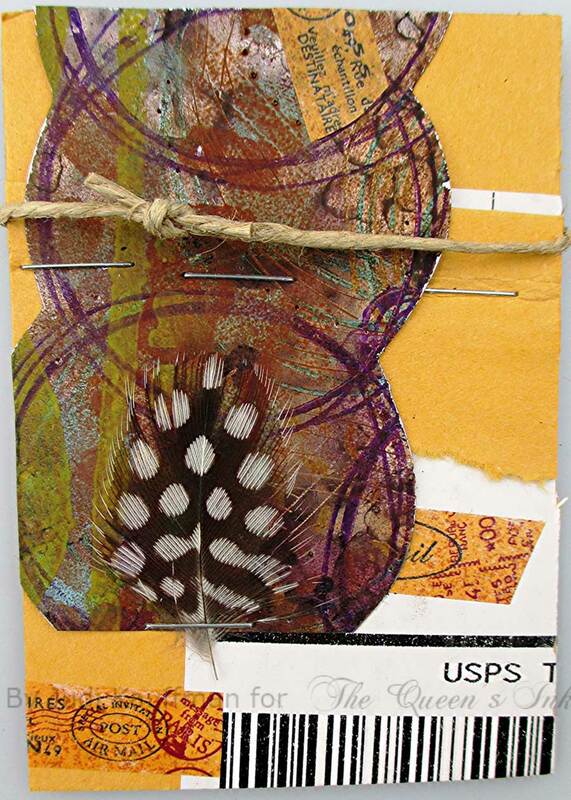 Create a bookmark from remaining scraps, additional pieces of cardstock, rubber stamps, and alcohol ink-altered leafy branch peel-offs. I like looking through it now and then. The scraps remind me of past projects and it’s rare that I can close the box without getting an idea for a collage or card or some other project. I’m proud to say I only allow myself a very small hinged plastic box for this stash so it never gets out of hand (6” x 6” x 3” – holds a lot but not too much!). I also save some larger pieces, too, especially sturdy cardboard mailing envelopes I can re-use. Put the two together – tiny scraps and a big envelope, mix in some feathers and staples and washi tape and the results became today’s project: Scrap Box ATCs and a Calendar. 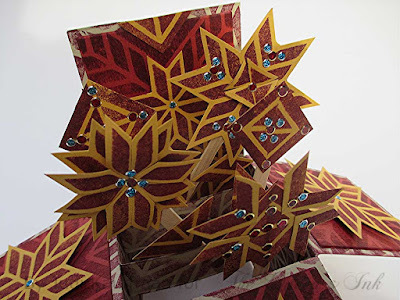 Layer One – Cut the cardboard envelope into 2.5” x 3.5” pieces. 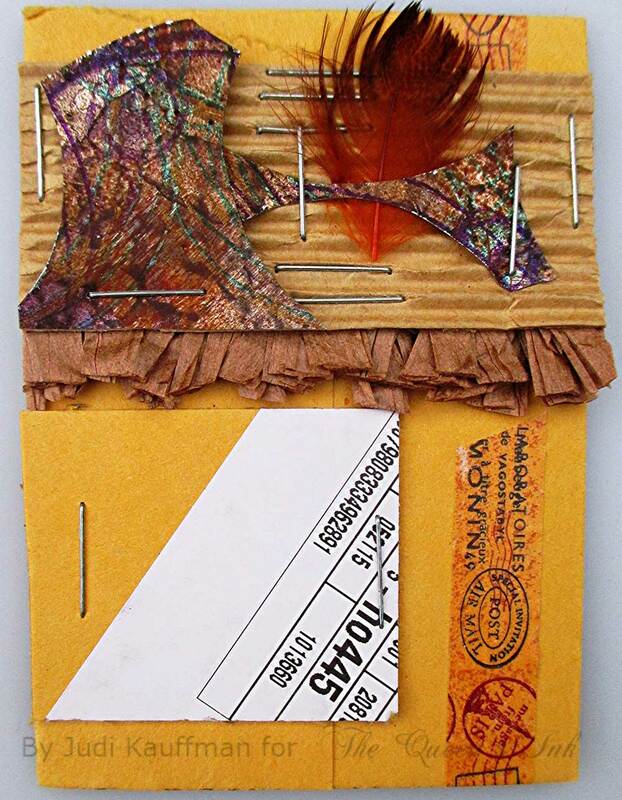 Glue and/or staple on additional pieces from the labels and other portions of the envelope. 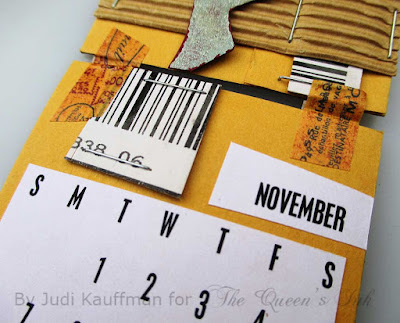 Layer Two – Glue and/or staple on pieces from YOUR scrap box! Move things around for a while, don’t glue anything in place till you’re happy with the layout. Tip: Leave your work table for an hour or two or a day or more. Come back with fresh eyes. Layer Three - Add twine, feathers or other embellishments as the final layer. 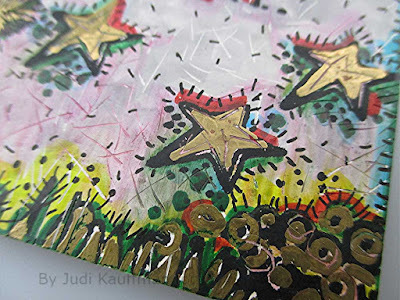 For the calendar: Choose two decorated ATCs and one that has only the first layer completed. Arrange them in a row, vertically. Punch a hole, centered, at the top of the first one. 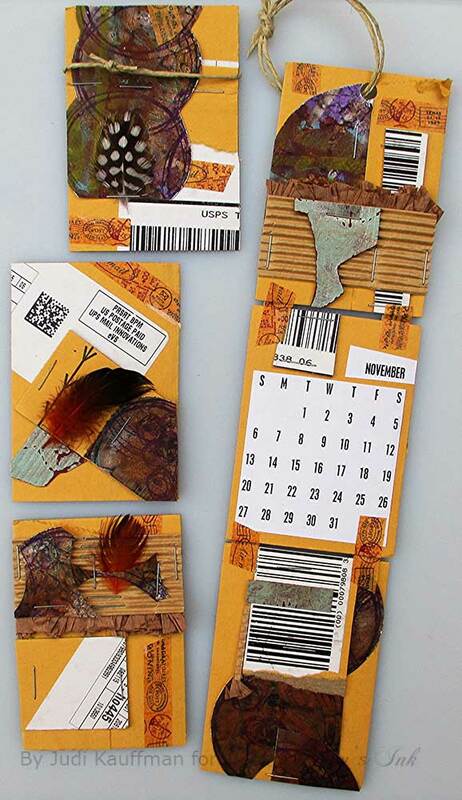 Add a calendar page or pad to the second (plainest) ATC. Connect the three with pieces of washi tape. Hang from twine, doubled and knotted as shown. For all other ATCs: Display on a small easel, swap with friends, tuck the ATCs away in an album, add to a card front. 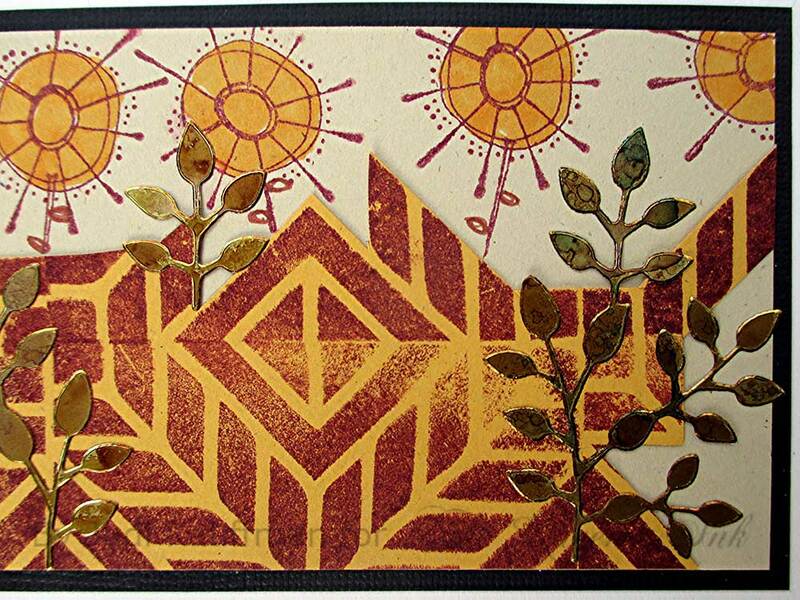 Instead of making ATC-size collages, work larger. Or smaller! Paint the first layer before adding the scrap box elements. 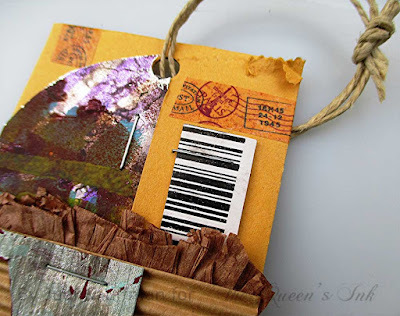 At any point in the project add in stenciling, stamping, paint, found objects. Layer envelope and scrap box elements into an art journal. Alter the sides of a box, the covers of a sketch pad, a photo mat or frame. I’m getting a head start on holiday gifts. 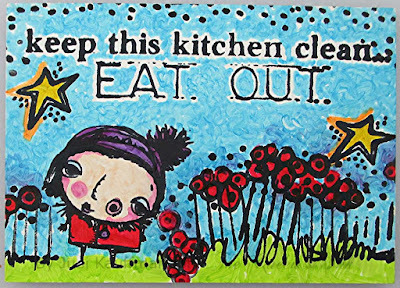 I thought that Stampbord fridge magnets would be fun to make for stocking stuffers, plus they’re flat and easy to mail. 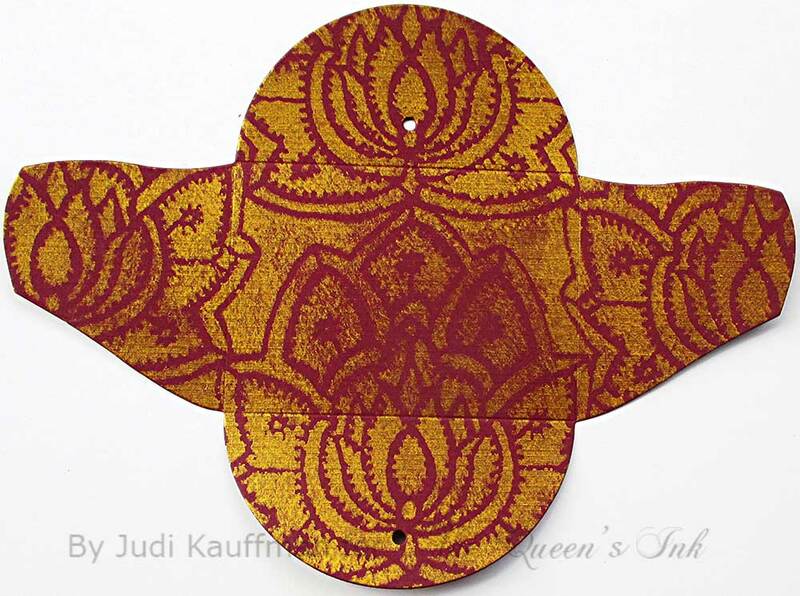 I chose 2.5” x 3.5” Stampbord pieces, but they are available in a variety of sizes so you can make smaller magnets or much larger ones. Stampbord, made by Ampersand Art Supply, has a smooth bright white clay surface, perfect for stamping and coloring. It’s also great for all kinds of mark making with pens or with scratching tools. And it’s nice and sturdy. 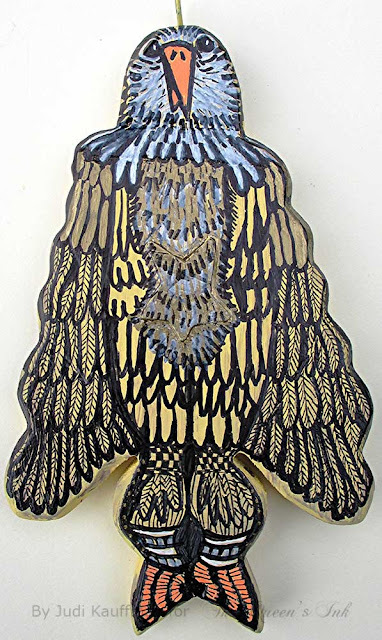 Boards are about an eighth-inch thick, the back is a neutral dark brown and resembles Masonite. 3. Glue on the magnets. Done! Paint the edges of the Stampbord. Sign and date the back! 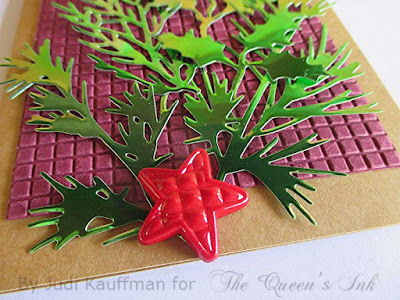 Instead of a magnet, turn the rectangle into a small hanging ornament. Drill holes in the upper left and right corner and add a cord. Glue the Stampbord to a pocket salvaged from an old pair of jeans or a piece of painted canvas to give it a larger presence on the wall, as shown below.